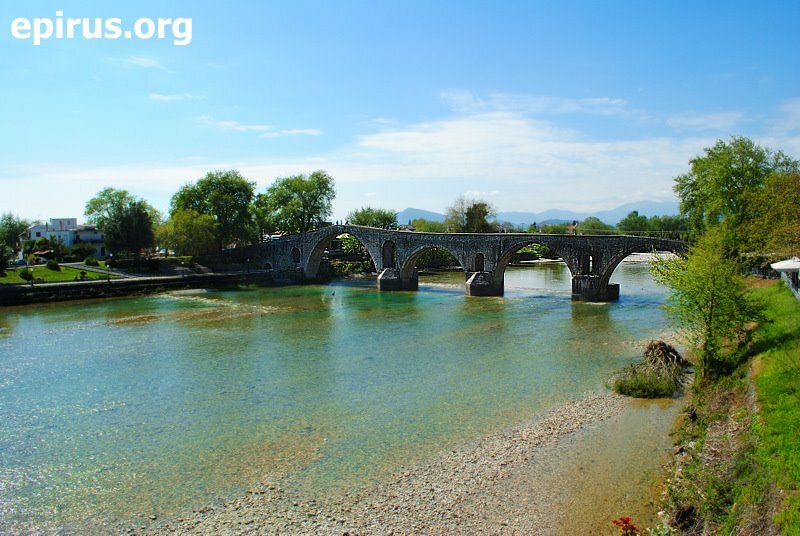 The famous bridge of Arta is located at the west side of city of Arta and at a distance of 1 km. from its centre. It is the most famous bridge of many arches in Epirus and bridges the two banks Arachthos river. It is one of the best preservable monuments of Arta. It is famous for its unique architecture but also for the legends which are connected with its construction. It is still undefinied the year of its construction. There are many different versions. It seems that it had been constructed during the 3rd century B.C., by the king Pyrros and was fulfilled in three periods during the period of Despotate of Epirus. It is elegant, imposing and its arches lean on strong stands. Its whole construction is admirable. Throughout the years many reconstructions have been done and many addsitions to the existing construction, with the last one in 1612. It is the bridge, of which its difficulty in construction appears in tradition, myths, poetry, painting, music and theatre where is praised the man’s labor for works like this one. Many charming legends talk about the consturction of the bridge, but the most moving of all is the one that refers to the sacrificε of the builder’s woman. The famous folk song “the bridge of Arta“, which has been a standard for many versions of it throughout the Balkan peninsula, says at its one lyric: “Unless the bridge is haunted by a man, the bridge will never stand still”. The folk tradition from its ancient times says that sacrifices are required for the foundation of difficult works, with the human sacrifice at the top, like in the case of the bridge of Arta. You can visit the bridge daily, every hour of the day.